As far as I can determine, little is actually known about the origins of Moqui Marbles. In the United States, most of them come from the Navajo Sandstone Formation in the state of Utah. These mostly smooth, eliptical or round balls of compacted sandstone are encased in a "shell" of hematite (an ore of iron). They are also referred to as "Moqui Balls", "Thunderballs" or "Shaman Stones" and come in a variety of sizes ranging from that of common marbles to that of a baseball. 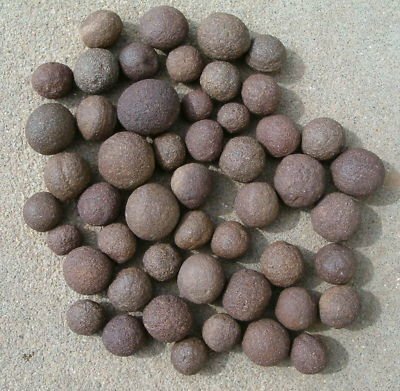 The photograph above provides an excellent example of the structure of Moqui Marbles although the color is not always as contrasting as shown here. Moqui marbles or Pitre stone are living stones, mumbling sounds.. protection against evil eye, keeps "false Friends" a far protection against fire/floods and lightning fertility in family, happiness and life energy improves enjoyment of life, coziness, company, easy to fall asleep - deep sleep - no dreams, relaxing stone, not feeling "bound to do something", regenerating, immune system fortifying physical and spiritual unity for body, mind and soul resolves blockades, provides light and joy of life, through the energy field around the marbles it provides a feeling of belonging to people, plants and animals. The word Moqui means A dearly departed one or Pitre in the Hopi Indian language. The legend that surrounds these concretions is that the ancestors of the Hopi played games with these marbles in the evening, when the spirits are allowed to visit the Earth. As the sun rises and they go back to the heavens, they leave the marbles so their relatives know that they are happy and well. This gives quick child birth and blessing of ancestors. If you want to get one contact us.